I just read about the latest social media tool, Hot Potato, which was launched at the TechCrunch Crunchup recently, and found it pretty interesting. From an event perspective, it looks like a great way to capture the happenings of your event in the real world and bring them to the virtual one. The service, which is accessed through the Hot Potato website, Facebook or a free Apple iPhone application, allows you to create a public or private chatroom. You can create an event or join an already existing one, post pictures, notes, etc. 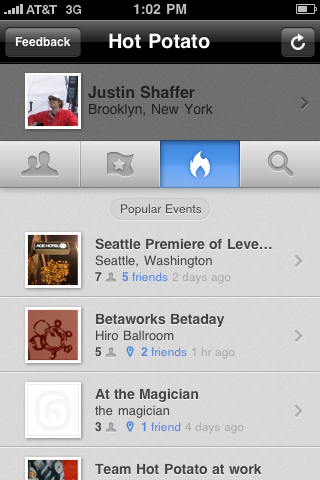 If you access through Facebook, it will populate a list of events happening which your friends are already participating in. And for Android and Blackberry users, Hot Potato hopes to launch versions of the service for you in late February. There is no denying that social media has had a massive impact on events. You can catch segments on YouTube, follow breaking news on Twitter and Blogs, and even join groups on Facebook that are created to capture content for a specific event. Many events have turned into webinars, where viewers can watch live events anywhere in the world. Long gone are the days when getting on a plane and heading to an event is the only way to network with peers, learn and celebrate. Robert Hylton and his fiancée Sonya Zilka have obviously embraced the social media age and using it to their advantage. Together, they launched The Spokanites Hitched 2010 Tour on YouTube and created a website, blog, and twitter account to keep all of their ‘fans’ in the know. And they’re already getting some press. So what makes this a tour? From their official announcement, “We are lucky to have friends spread around the world and we love to travel, so we are bringing the party to you.” In other words, they are foregoing the traditional nuptial celebration by bringing the party to their friends by having a total of nine parties on three continents. While I’m not in the wedding business (and don’t want to be) this concept does get me thinking about how we handle corporate events. A current theme for us in the PR world is to hold East and West Coast events, duplicating the show for the press in each market. In other words, we’re bringing the news to the influentials rather than expecting them to come to us. I personally believe that nothing will ever replace the value and relationship building that meeting face-to-face brings. I also believe that companies and event planners need to look at bringing the show to their attendees rather than expecting everyone to come to them. I wonder when we’ll start to see World Tour Events.